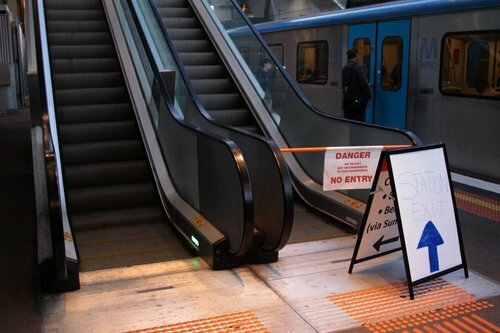 You don’t have to look far on Melbourne’s rail network to find failure, but the escalators at North Melbourne station would have to take the cake for their endless outages. So how many times have they broken down? 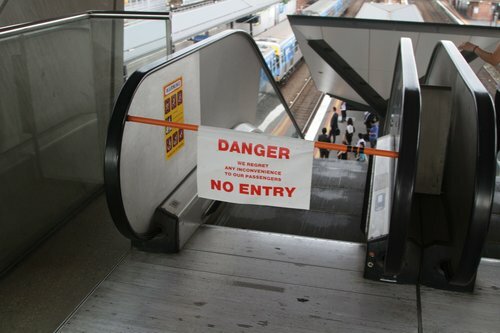 I first bothered to take a photo of a failed escalator at North Melbourne station on October 10, 2012 – the defective unit was leading to platform 2/3. 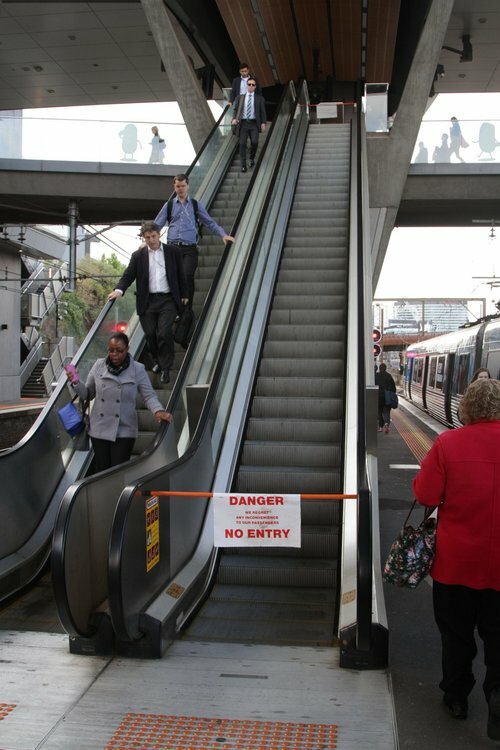 November 21, 2012 an escalator to platform 1 broke. And stayed that way for a day. 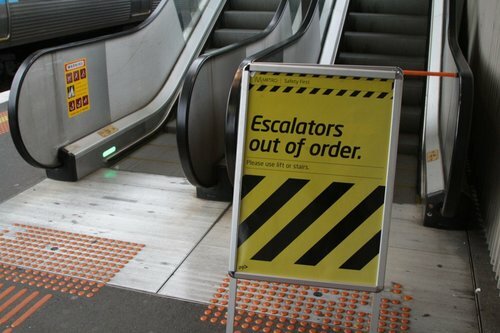 Staff put up an ‘out of order until further notice’ sign, with the escalator still being broken three days after the initial fault. 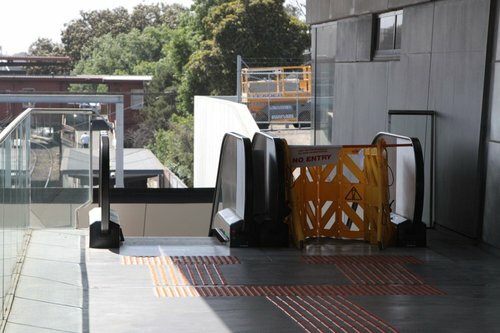 A few weeks later on November 26, 2012 the other escalator to platform 1 broke down. 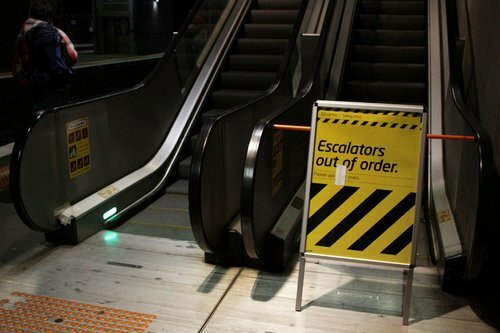 On December 5 the escalator for platform 6 was next to fail. 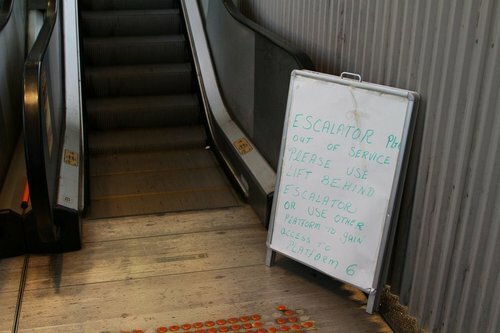 A few months went by without me noticing a failed escalator, when on March 27, 2013 I discovered a hand written sign advising passengers of the fact. 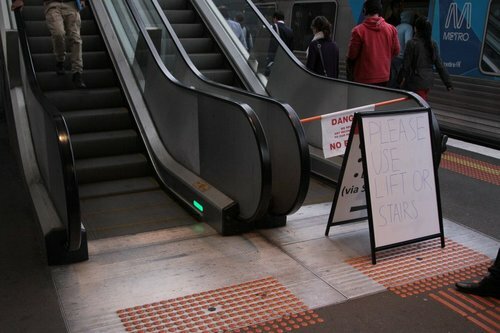 A few days on, and that escalator to platform 1 was still broken. 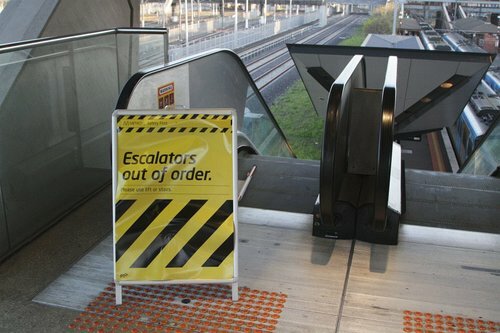 Two weeks later the escalator was still kaput, when I took this photo on April 10. Fast forward to late 2013, and I spotted an out of service escalator to platform 6 on December 23. January 8, 2014 the same escalator broke yet again. 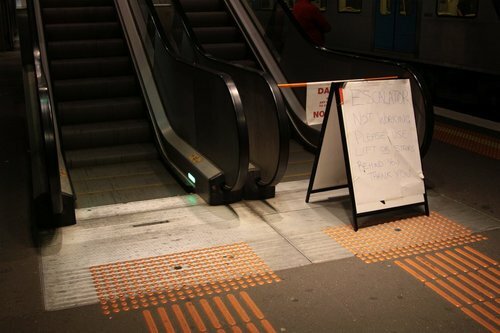 Staff wrote out a sign telling passengers to use the staircase or lift to exit the platform. April 30, 2014 an escalator to platform 2 and 3 died. 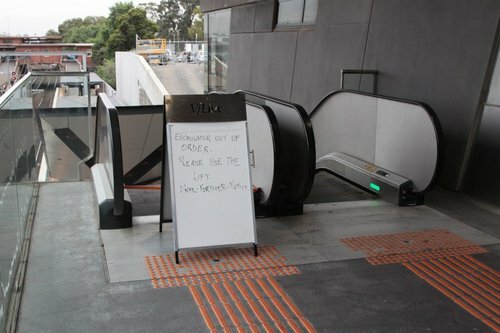 May 30, 2014 the escalator leading to platform 6 died again, leading some wag to write “Is this a joke” on the sign. Metro Trains must have picked up on the plague of escalator failures, as they printed up some fancy looking posters to take the place of the handwritten signs. But two days later on July 4, that sign was still there. 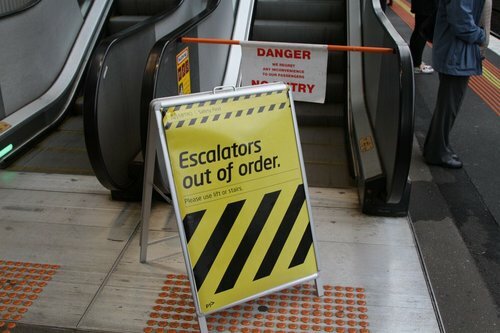 On August 12, 2014 it was the turn of platform 1 to receive the new ‘Escalators out of order’ posters. Two days later platform 6 snatched it back. Platform 2 went belly up on October 28, 2014. A day later the fancy ‘out of order’ sign was out, but no mechanics to fix the fault. With so many photos of failed escalators I am now starting to run out of witty captions – this was platform 6 on November 11. Platforms 4 and 5 appear to be the least trouble prone – this photo was from December 1, 2014. In the race to fail, with platform 2 and 3 racking up another win on February 3, 2015. At least this time there was technician there to fix it – they needed to pull out the electronics box at the top end. 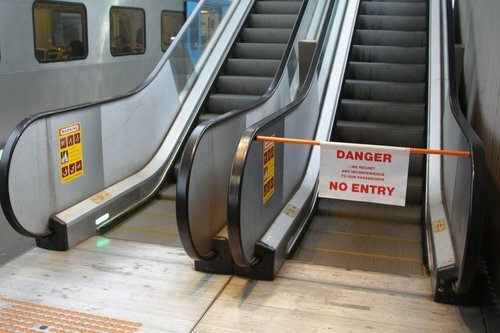 So which escalator failed the most? Collating the data found above gives me this table. I have numbered the escalators 1A to 6B – east to west, based on platform number they serve. Looks like platform 6 is the big dud! 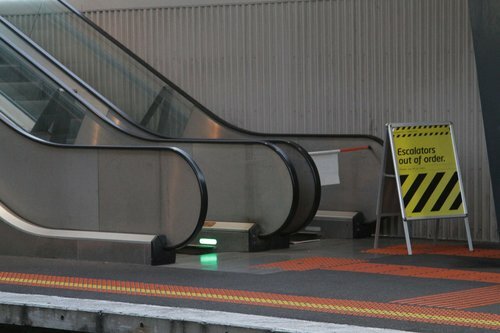 October 2012 to February 2015 is 29 months, and in that time I’ve seen the escalators at North Melbourne break at least 16 times – so that is once every two months. 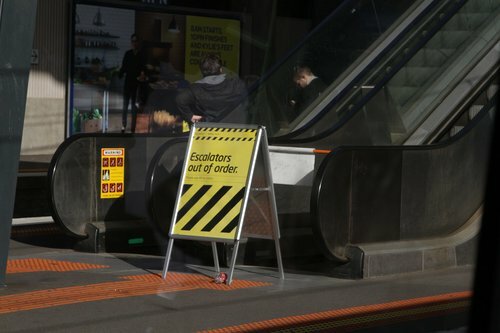 I’ve been working in Melbourne CBD Monday to Friday for that entire time, which suggests that the number of escalators failures could be higher, but probably not by a massive amount. 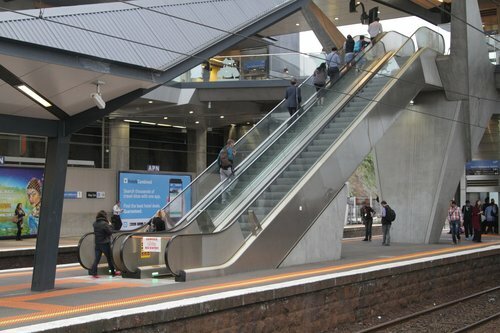 Finally, of the other railway stations I pass through, neither Southern Cross or the City Loop stations appear to have as escalators that fail as frequently – is there something in the water at North Melbourne? Perhaps it’s the open design of the platform? Perhaps getting a lot of elements passing into it from around the side with the wind? Blah, honestly, I’d much prefer they just put in a bunch of stairs, at least those never break down. I think we are a spoilt society if we need an escalator to lift us such a short distance. I’m personally more pissed off at the complete and utter lack of seating on platform 1 and 2 of melbourne central. True? This station should be avoided late at night when waiting times can be up to 30 minutes. Both platforms 2/3 and 4/5 appear to have provision for a set of stairs to be added behind the lift – it does raise the question as to why only platforms 1 and 6 received them. 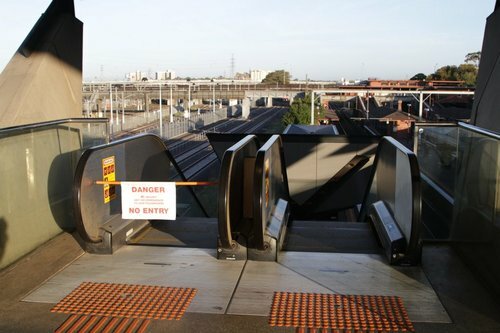 As for the most efficient way to change platforms, a steep ramp like the north end of North Melbourne station seems like the best option. However I wonder if it would be considered acceptable under DDA regulations, even if a lift was also provided for those with limited mobility. The weather hypothesis is supported by 6B being the most exposed escalator. 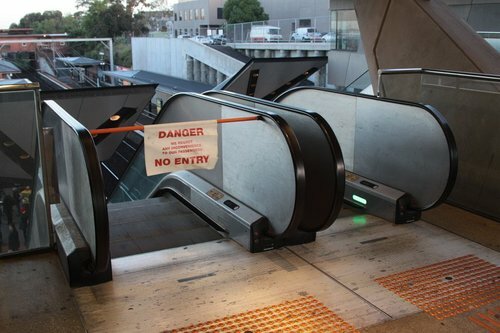 This also likely explains why they, despite being much newer, they have many more faults that the City Loop escalators. 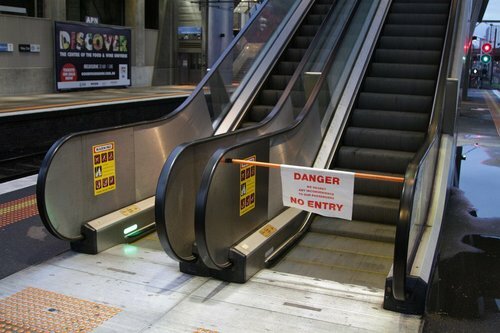 The Escalators should get some more shelter. You’re right about the ‘roof’ at North Melbourne being useless! 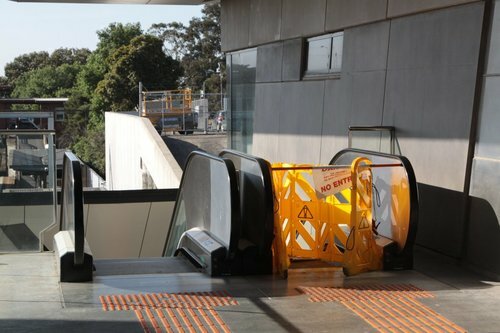 I have part two on the topic of North Melbourne’s escalators coming up next week, but the wet weather hypothesis is one I didn’t consider – stay tuned! The passengers flows at North Melbourne are interesting – the ‘City Loop to platform 6 march’ of an evening is a strong one. 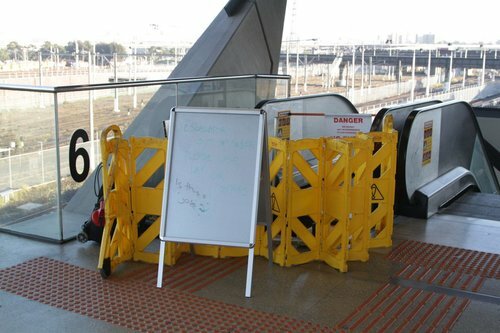 However in the morning the flow is more balanced – passengers from direct trains change for the City Loop, matched by Craigieburn / Sunbury / Upfield line passengers headed for Southern Cross. Presumably there are also some Flinders St passengers changing to direct services as well, rather than go around the loop. Presumeably there are less of them in the evening because they want seats on the way home and they are full before North Melbourne. There might be a few, but it would be interesting to compare it to the Burnley and Caulfield Group – with Flinders Street Station near the midpoint of the Northern Loop, the time saving between ‘direct’ and ‘loop’ trains is much smaller. If one escalator is broken and there is no stairs, couldn’t they simply turn the operational one off so that it can temporarily act as bidirectional stairs? Or is that some kind of OH&S hazard? 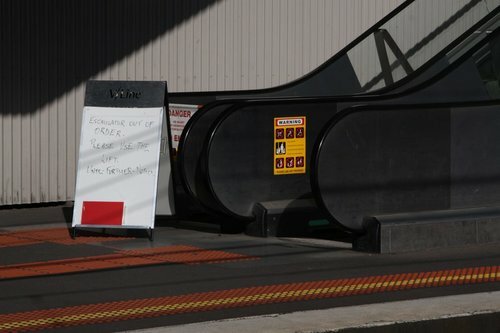 Laverton’s dodgy lifts have been covered before – over 100 breakdowns in 10 months! As for OH&S issues, sharp edged escalator treads look a lot more painful to fall onto than even hard concrete stairs. 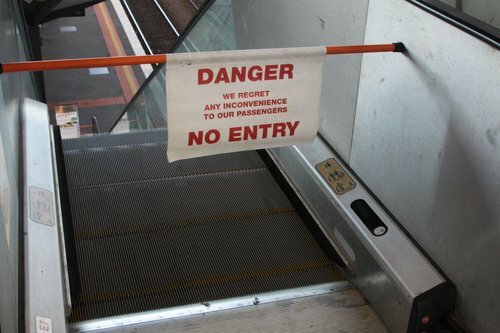 I wonder whether these escalators are in compliance with these requirements. are non DDA compliant. 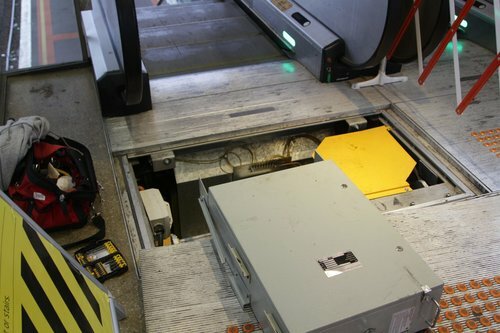 Ramps should be built in combination with escalators in case of break down. Ramps are the preferred design for platform transfer. The old Edwardian Stations are an example. The VRIOGS standards also specify the pumps that need to be specified in pedestrian subways – yet they still floor in heavy rain!